Using a probe when stimulating your pelvic floor is like sat-nav for your pelvic floor muscles. Performing manual Kegels is all well and good if you know how to do them correctly – but using a probe is the best way to guide you in the right direction. Kegel8 probes come in a variety of shapes and sizes – all designed with a unique way of targeting your pelvic floor. But, how can you ensure that your probe will stand the test of time? Read on to learn more. Kegel8 probes are recommended to be replaced after 60 (1 hour) treatments, but if you treat yours with care it can last you many years. Want to get the most out of yours? Clean with Care – To remove all bacteria from your probe, without causing any damage, use Kegel8 Cleaning Spray. All you have to do is spray the formula a few times and leave your probe to air dry! Rubbing the probe can scratch the electrodes so be careful if you choose to clean the probe with soap. Make sure you check for wear and tear between treatments. Store Safely – To keep your probe extra clean and damage-free between uses, try storing it in something like the Kegel8 Carry Case. You can store away your probe, wires and controlled in a handy little case – but be careful not to wrap the wires of your probe around your electronic toner as this can cause damage and shorten the lifespan of your probe. Boost the Benefits – Use an exercise lubricant to help conduct the electric current from the electrodes on the probe into your pelvic floor muscles. This can produce more effective muscle contractions and help you achieve a strong pelvic floor in less time! Watch the Wires – When removing your probe, avoid pulling on the wires as this can cause a weakness in the connection overtime, shortening the life of your probe. 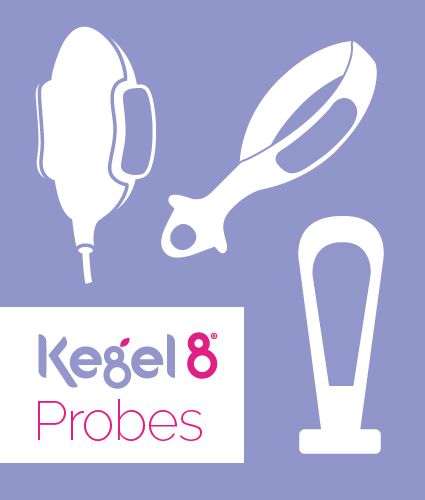 Phone a Friend – If you have any questions or queries regarding your probe, give the Kegel8 customer care team a call on 01482 496 932, or drop them an email at [email protected], and we’ll help to resolve your query. What do you do to prolong the life of your Kegel8 gadget? Let us know on Twitter or in the comments section below. Not sure which probe is right for you? No problem, take our quick and simple quiz to find out. "This probe is what I have been waiting for. The fact that it doesn't protrude enables me to sit and watch TV or check e-mails etc. Or I can just get on with the things I have to do without fussing about the position of the probe and whether it will stay in place. No pinching either and contractions feel stronger as well. So its an all round winner. Whoever invented this should be knighted- immediately! " Dotty - Best probe yet! "I have tried a few probes but this one beats them all. It's so comfortable I didn't feel it at all. I could stand up and move around without it slipping out of place. The only thing I felt was the muscles working a lot better than other probes. "